Please enjoy this special scene between Jasper and Callie from FAR FROM BROKEN and I'll see you in the new year! He reaches out, but Callie stops him by leaning in for a kiss. It starts sweet and soft, but soon becomes hot and deep, and he’s lost himself in her. But she’s already pushed the button, laughing joyfully. He shakes his head, but inside he’s pleased. Every day she grants him a smile is a gift, but when she actually laughs aloud he thanks God for miracles. The box starts to rumble, and they both turn their attention to it. It shakes across the floor. Standing, he pulls Callie up and they step a few feet back. The box is unfolding itself. As it opens, they see that inside is a kaleidoscope of greens and reds, silver and gold. “But what is it?” He peers closer. The box is no longer a box. As it continues to shift, he’s still not quite able to pinpoint what it is. And then he recognizes it too. The box has indeed transformed into a kind of tree. Made of metal tubes shooting every which way, it’s both the oddest looking and most unique Christmas tree he’s ever seen. On its limbs there are small rings, and each ring holds a pretty little ornament. Some are gold, some silver, and some red. Once it’s fully formed, the room falls silent. They stand together. He takes her hand, and she leans into him. “It’s lovely,” she whispers. He agrees. “Whoever put this together is a genius. I wonder if—” He reaches out to touch it, and as soon as he makes contact, the whole tree lights up. Light shoots out the ends of each of the metal tubes until it is completely enveloped in a golden glow. Colonel Jasper Carlisle was defined by his work until he met his wife. When the prima ballerina swept into his life with her affection, bright laughter and graceful movements, he knew that she was the reason for his existence, and that their love would be forever. But their world is shattered when Callie is kidnapped and brutally tortured by the foes Jasper has been hunting. Mechanical parts have replaced her legs, her hand, her eye...and possibly her heart. Though she survived, her anger at Jasper consumes her, while Jasper's guilt drives him from the woman he loves. He longs for the chance to show her their love can withstand anything...including her new clockwork parts. As the holiday season approaches, Jasper realizes he must fight not just for his wife's love and forgiveness...but also her life, as his enemy once again attempts to tear them apart. I'm still hopping around all over the place. Visit Books-N-Kisses and join in her Christmas Countdown to win prizes, and check out my post about favourite treats of the holiday season. I'm also visiting Urban Fantasy Reviews on December 15, to talk about FALLING HARD and offer a copy of the book, as well as a set of Romance Trading Cards. They've also done a really lovely review here, so check it out! On December 19, I'm blogging at Manic Readers and sharing a favourite cookie recipe, and on December 21, the Clockwork Christmas authors will be there to talk about steampunk gadgets their characters would love to have for the holidays. On December 22, please visit me at Deborah Cooke's blog for my guest post about writing a holiday-themed story. But don't forget to come back here to the blog before Christmas for a very special holiday treat from Jasper and Callie, the hero and heroine of Far From Broken! Congratulations to Cristal Ryder who was randomly chosen to win a print copy of AGONY/ECSTASY! Thanks so much for the support, everyone! I hope you love the stories in this great anthology! It's release day for Agony/Ecstasy - a fantastic anthology published by Berkley Heat and edited by Jane Litte of Dear Author. To celebrate I want to give away a PRINT copy, so leave me a comment with the name of one of the authors included in this fantastic compilation of stories. 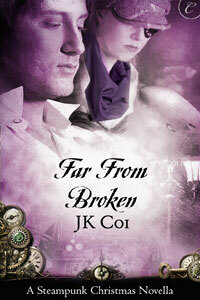 TODAY is release day for FAR FROM BROKEN and A Clockwork Christmas!!! And tomorrow the Agony/Ecstasy anthology releases, which has my story CAGED. We’re all so excited, so you’ll find Jenny, PG, Stacy and me all over the net pimping these fantastic holiday novellas—and giving copies away! All week you’ll be able to find us at Long And Short Reviews – we’re in the SPOTLIGHT with Clockwork Christmas! We're also being featured at Books On Board. There will be stockings hung by the fire, hot chocolate and other treats, and be sure to check out the Author Q&As! Today I’m visiting the ladies at the Romance Writers Revenge to talk about Far From Broken, the Agony/Ecstasy anthology, and some of my other new and upcoming releases. I always love visiting the pirate ship. Then on Thursday I’ll be at Steamed! with a blog about what I’ve learned (and still have to learn) about writing steampunk. But that’s not all….the party continues next week too!